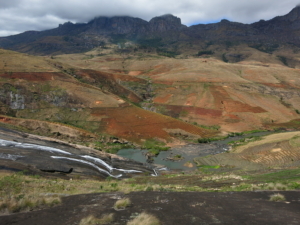 In the context of the implementation of Madagascar’s New Energy Policy, the Ministry of Water, Energy and Hydrocarbons and the Agency for the Development of Rural Electrification (ADER) in partnership with GIZ-PERER (Electrification Project through Renewables) intend to accelerate the process by supporting the elaboration of feasibility studies and detailed design studies before starting a “call for projects”. Skat was mandated to elaborate these studies as a basis for the rural electrification based on renewables and to implement a training session for local stakeholders (ministry, ADER, regulator and private operators). Dr. Hedi Feibel as project leader and hydrologist, Peter Eichenberger as civil and hydraulic engineer, Martin Bölli as electrical engineer, Patrick Alléoud, Daniel Figi as geologist, Heinz Pape, Steffen Schülein, Toniniaina Rakotozanakajy, Audin Rokatovao, Paul Rakotondralambo, Elisé Asinome, Solomahefa A. Objective: Elaboration of two feasibility studies (at the sites Ivato Centre and Ambatotoa) and one detailed design (at the site Sahandaso) as sound basis for electrification of the surrounding rural areas. Activities: collect hydrological data (install gauging stations, make flow measurements etc. ); implement site surveys to collect relevant data and information; design the civil structures and electromechanical equipment as well as transmission and distribution network; implement a demand survey in households and other consumers; provide training on key elements of a feasibility study and a detailed design and tools for quality check of such studies. Results: Two feasibility and one detailed design studies presenting feasible, sustainable and profitable options to make use of the available hydropower potential for rural electrification; the training session enabled the partners to better assess the quality of such kind of studies.